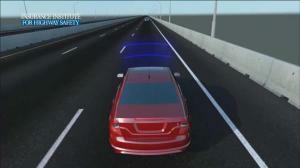 Will Crash Prevention Technology Prevent An Auto Accident? Vehicle safety has come a long way during the past 50 years. The Insurance Institute for Highway Safety and the National Highway Transportation Safety Administration both conduct several safety tests for new vehicles every year. Their tests determine ratings, and safety ratings are a key role in many families’ buying decisions. However, these features are not enough to provide a 100 percent safety guarantee on the road. Auto manufacturers add very useful features to modern vehicles. Since the IIHS and NHTSA are continually tightening their safety requirements, newer vehicles must continually improve to keep up with them and earn the highest ratings. These are some of the latest safety features. These collision warning systems use either a radar or camera to detect vehicles in front of a moving car. When the front of the car reaches a certain length of space between it and the rear of the vehicle ahead, an alert is initiated. Some vehicles also brake automatically when the gap closes in fast. However, they do not always brake fast enough, and drivers may still fail to manually brake in time to avoid a crash. Using a sensor, this safety feature senses vehicles entering or lingering in a blind spot. When there is another vehicle in the blind spot, a warning light appears on the drivers side. It is typically on the door near within sight of the side mirror. This safety feature uses a camera and software. When the vehicle comes too close to the lane markings from the camera’s perspective, the software initiates a warning to the driver. Depending on the vehicle or product, it may be a light or a verbal warning. The catch is that they usually only work when a turn signal is not on. If a driver leaves a turn signal on without realizing it and relies on this technology, a crash could still happen. Also called lane assist, this technology is similar to the aforementioned lane departure warning feature. However, it also manipulates the steering wheel to correct the vehicles’ position. However, these systems can have faults when there are improper road markings or the markings on the road are not visible. For example, when the roads are covered in snow or ice, these systems are not very useful. This system automatically applies the brakes when a vehicle approaches another vehicle or object ahead. It may also brake in a variety of other situations with certain safety features. Many crashes happen at night because drivers cannot see properly. Adaptive headlights automatically adjust the brightness based on the surrounding darkness and approaching vehicles. This eliminates the need to flick brights on and off, and some vehicles reposition the lights to enhance visibility. This may not always be enough to prevent collisions with deer, objects in the road or even other vehicles. This type of cruise control combines crash avoidance technology with the benefit of maintaining a safe speed. In the past, drivers had to brake when approaching the rear end of a vehicle ahead. This technology automatically slows down and speeds up based on the distance of the vehicle ahead, which greatly reduces the chances of a rear-end accident. However, it may not prevent an accident if the driver does not manually brake and the vehicle ahead brakes too fast. While several vehicles earn Top Safety Pick and Top Safety Pick+ awards from the IIHS, there are still many vehicles that do not. Experts at the IIHS point out that these safety features help, but statistics show they do not always prevent crashes. It is best to think of them as assistance but not rely on them completely. Also, the IIHS recommends understanding limitations and vehicle-specific statistics. Keep in mind that practicing safe driving and having safety features does not prevent the irresponsible or negligent actions of other drivers. Car crash victims are always hardest hit, and the effects of being in an auto accident may be forever. Following a car crash, a person may be completely disabled or have permanent injuries. A traffic collision attorney can help. Only a car accident lawyer can recover the most money for damages, because auto insurance companies never offer enough money to victims to cover a lifetime of medical bills after an auto accident. A traffic collision attorney can also recommend doctors, assistance programs and much more for injured victims. When safety features do not make the cut and other drivers are at fault, always contact a car accident lawyer for help.